Something Awful put some keychains up for sale recently, and I bought one. It’s nice, and bigger than I expected. Sigmund, as usual, thinks it’s an opportunity to get pet. meow! i'm sigmund and i LOOOOVE to get pet. why? because kitties are like that. 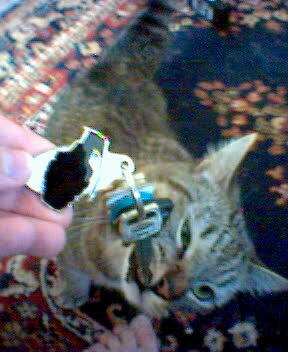 maybe i'll eat owen's keys so he can't leave the house, so he has to stay here and pet me!